A Mac-using relative recently passed away, and there are some SMS and voicemail messages on her phone that we’d like to have copies of. I don’t see any way to extract those things. Is this possible? When you back up an iOS device to your computer, SMS and voicemail messages are part of that backup. The backup resides in youruserfolder/Library/Application Support/MobileSync/Backup. Don’t bother rooting around in that folder, as you won’t find anything usable unless you’re intimately familiar with SQLite databases; the files look like so much gobbledygook to most people. Instead, turn to a tool that can extract the information you want, either directly from the phone or from one of the iPhone backups. 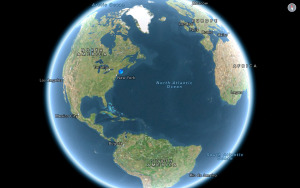 For this kind of thing, I routinely turn to Ecamm Network’s $30 PhoneView. If you’d like to recover information directly from the phone, plug it into your Mac using the sync cable. PhoneView will launch and show you a screen that looks a bit like iTunes. In the left column under the Data heading, you’ll see entries for Disk, Contacts, Notes, Call Log, Messages, Web, Voicemail, and Apps. Choose Messages, and you’ll see a list of SMS and MMS messages in the second column. When you select a message, the contents of the conversation appear in a third column. To create a copy of that conversation, just drag the name or number from the second column to the desktop; it becomes a PDF file, and contains the entire conversation. Likewise, if you want to copy a voicemail message from the phone, select that entry and drag it to the desktop. When you do, the voicemail message appears as an AAC audio file that you can play in iTunes. 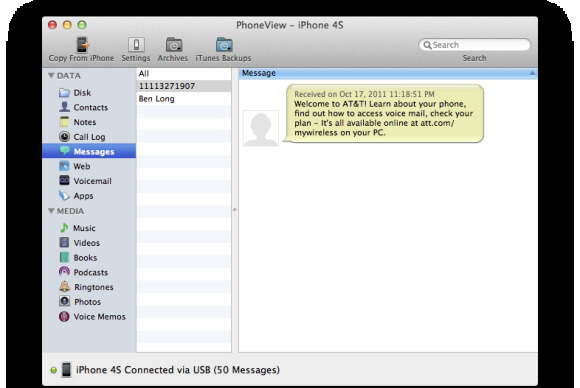 If you have access to this person’s Mac and their account, PhoneView can provide even more help. From PhoneView’s File menu, choose iTunes Backup and then, from the submenu, select View Call History iTunes Backups, View Message iTunes Backups, or View Voicemail iTunes Backups. The window that appears will list, in a pop-up menu, every iOS device backed up on that computer. Choose the one you want, and you’ll spy a list of backed-up data. Again, just drag whatever you like to the desktop to turn that data into something you can read or listen to. The advantage of pulling data from an iTunes backup is that if your relative had multiple iPhones over the years, it’s likely you’ll find all the accumulated voicemail and SMS messages rather than just those stored on her last phone.